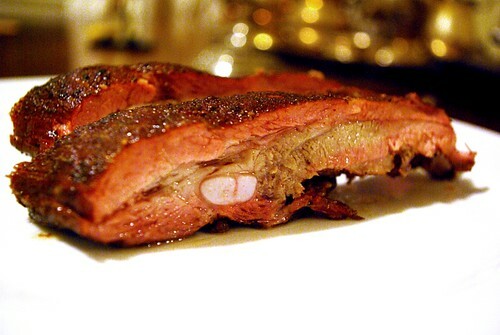 tender rubbed and smoked spare ribs, originally uploaded by aarn! +3rd June, 2009+. removed the membrane from the bottom of two untrimmed 4-lb racks of spare ribs. rubbed the ribs with the same rub as the pork butts [1t. fresh ground black pepper, 1t. ground cayenne pepper, 2T. ground arbol chile, 2T. ground coriander, 1T. dark brown sugar, 1T. dried oregano, 4T. spanish paprika, 3T. kosher salt (ground some of this fine, the thought was that the fine salt would penetrate better and do a different job than the larger crystals), and 1T. ground white pepper]. placed the racks in a 250-degree offset smoker with smoldering chunks of hickory for a few hours, using a mixture of 1c. cider vinegar, 1T. red pepper flakes, 1T. kosher salt, and 1T. sugar, to mop the rib occasionally. after three hours or so, the ribs were pulled, wrapped in tin foil and placed in a 300-degree oven until the bones pulled away when tugged, about two hours.